Writing about disappointments is harder and not nearly as much fun as writing about the big successes and I have certainly had a ton of blowups and dnf's over the years. And while it's hard to call a 3:52 marathon, my fastest in 3 years a disappointment, I didn't accomplish what I came for and what I felt I was conditioned to do. But for me the biggest disappointment was not my failure but that I was not able to miraculously pull Amy along to her Boston qualifier. Yes, after all we had been through to prepare for this I was looking forward to going to Boston and sharing the experience with her but it was always about getting her there and helping her achieve a dream. Although neither of us were successful in achieving our goal we hopefully have learned something in the process and are determined that we will get there. It was long shot from the beginning for her to improve on her marathon time so much in such little time but as I shared in the previous posts of our training, I couldn't be more proud of how hard she has worked and how far she has come. I know going forward that we are both going to continue to train hard and stay focused as we are "Running down A Dream ". She will get to Boston, set a lot of pr's in the process. and I will do all I can to defy the odds and the years and get one more marathon pr before I am done. We don't really know right now exactly when it will happen but the work is just started as well as the fun that we will share in the process. In the meantime, we are both going to run a 5k in 3 weeks to take advantage of our condition and get Amy her first age group podium finish and for me hopefully my best 5k in several years and maybe a podium for me too. Oh, and right now I am back in ultra mode for awhile with a 100 mile pr attempt coming up in 5 weeks. But have no fear, the training is going to continue like we have been doing. 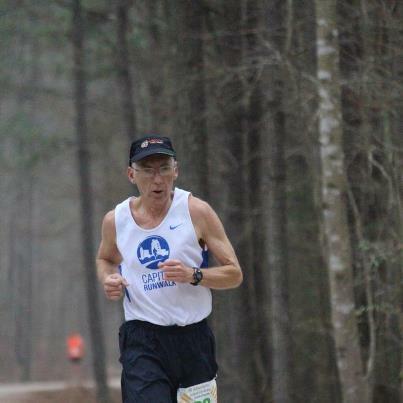 I have proven to myself that for me I run my best ultra's when I am training for a fast marathon. I know there is no way I would have shattered my 50 mile pr in January if I had not been doing this type of training with Amy. The only thing that will be done differently is that I will add a run/walk workout about once a week just to get back to practicing being able to walk fast and strong. Otherwise the tempos, intervals, marathon and half marathon pace runs, the strength training , core and yoga will go on. Oh, you were expecting a race report ? Ok, here is the Cliff Notes version. With much excitement but knowing we had a tough task before us, Amy and I lined up together a few minutes before the start with the intentions of sharing all 26.2 miles. We had a plan,the training was done and now we just had to make it happen. Things started off perfectly as we stayed calm and relaxed and hit the 1st mile a little slower than what we needed to allow a good warmup. By mile two were were right on track. The pacing for the next couple of miles was perfect also but in mile 5, Amy dropped back a couple of seconds. No problem since we were running about 5 seconds over goal pace so I dropped back to her. But she once again dropped back again and when I checked the 6 mile split, we had slowed to 15 seconds slower than what I needed. I looked back to her and knew I had to go so I turned my attention forward and picked up the pace. I was sad to leave her so early but all I could do was try to stay focused on my race. I was now hoping and praying she could settle into a pace that would still get her a 3:45 and a BQ for her. My pacing continued perfectly for the next several miles and shortly after making a u turn around the 9 mile point I began looking for her. I saw she was maybe a 1:30 minutes back but I knew she had been planning a pit stop and she was running well so I was hoping she would stayed locked into that pace. I was still crankimg out the miles like clockwork and feeling pretty good. 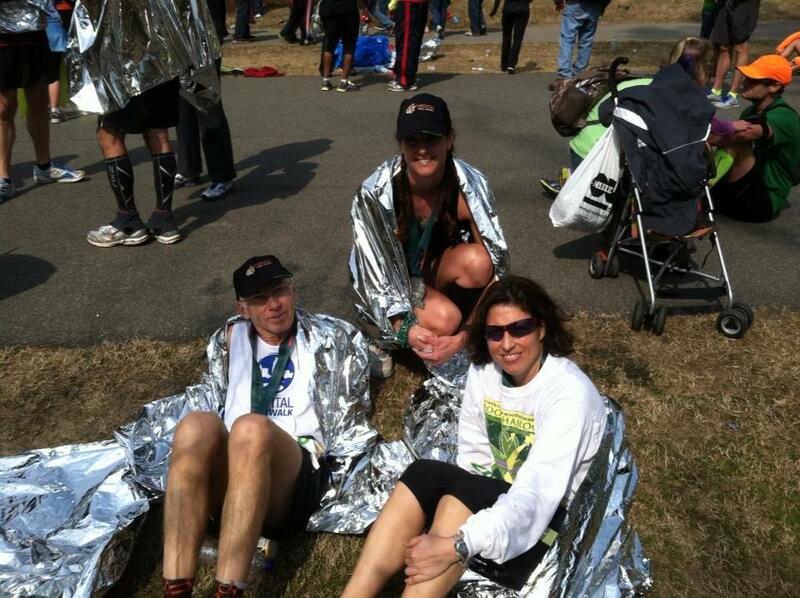 I saw Amy's family around mile 11 -12 and told them to let her know her new goal pace was 8:33's as I continued on. I went through the half in 1:49:05, right where I had planned it with almost a minute cushion and still pacing dead on. 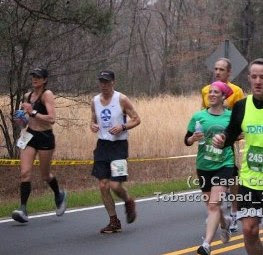 Even through mile 17 I was doing ok and feeling confident but then mile 18 was a little slow. I wasn't too worried because it was a slight upgrade but by 19, I was slowing more and not feeling good, I saw Gene Meade working the turnaround and told him I was losing it. And at mile 20 I lost a full minute and knew it was over. The worst thing though was when I saw how far back Amy was and she did not look happy and she didn't even see me as I passed by. I knew the Boston dream was over but I was still hoping to salvage something from the race and try to hold on for my 2nd fastest marathon and I was able to pick it up slightly the next mile but by mile 22 I was alternating between a jog and a shuffle and each new time goal slowly ticked away. Now I just wanted to get it over with. With about a mile to go a friend, Tony rode up to me on his bike and he told me that Amy and Margo were going to be close to sub 4. I knew that was a disappointment for her but it would be a pr at least and something positive to take from it. I crossed the finish and then waited in the finish area for Amy. I had to stay out of the way so I lingered by the medical tent so they wouldn't run me off . I was determined to be there for her when she finished. Margo came in under 4 but I couldn't see Amy and I was praying for her to come on and sure enough a few seconds later she came into view and I could see she had the sub 4. As I expected she was in tears so I quickly made my way to her and we just hugged and shed a few tears. Like I said was disappointed but my heart was breaking for her. And that's about it. Time to move on now to more adventures with fun along the way.